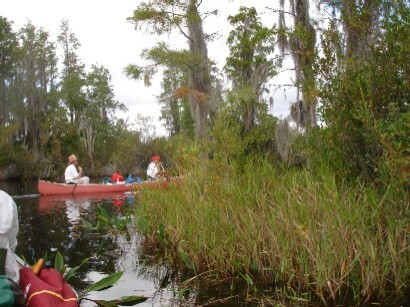 Folkston, GA--The Okefenokee canoe trail system is still recovering from the fires and storms so most trails remain closed. Some alternate trails are available but the shelters at Big Water and Maul Hammock have not been rebuilt and the trails to Round Top, Floyd’s Island, and the orange trail beyond the Suwannee Canal shelter remain obstructed. However, plans are to rebuild. Currently camping is allowed at the Minnie Lake shelter and at the Monkey Lake shelter. These were day use shelters only but will be part of the expanded trail system. Chip Campbell also says that the Craven’s Hammock trail will be re-opened when conditions improve. The Fellow Travelers normally plan a three-day October trip but that was not possible this year, so the King arranged a permit for October 11 and 12 to Monkey Lake. It is the same shelter used by Greg Baker, Art Shelfer, Tim Eidson, and Charlie Stines during the March downpour. Ten paddlers signed up for the trip. Roy Moye came up from Florida, Tim Eidson came from Cordele, rookie Julie came from Moultrie as did Charlie and Diane Stines, Art and Janice Shelfer came from Tallahassee via Miccosukee, Rick Metz and rookie Richard Mayotte came from Marietta, and Joey Autrey came from Meigs. Roy camped at Trader’s Hill on Friday night, Rick and Richard stayed with Mr. Patel at Folkston’s Western Motel, and everyone else drove down to the Suwannee Canal Recreation put-in. Amazingly, no one was late. Charlie supplied all the canoes. Roy and Tim used the red Penobscot 16, Art and Janice paddled the Penobscot 17, Julie and Joey teamed up in the green Tripper, Rick and Richard manned the red Tripper, and Charlie and Diane got the Canadienne. The canoes were not heavily loaded. The trip was underway by 9:30. The first leg of the journey was about two miles down the Suwannee Canal. Nothing exciting happened but it was an easy stretch with a pleasant breeze under overcast skies. Wildlife was not abundant and not even an alligator was seen. After the canal stretch the canoeists turned left toward Chesser Prairie. The fall wildflowers were very pretty but again wildlife was scarce except for the usual wading birds. The water levels were not high but there was enough water for comfortable canoeing. At the end of Chesser Prairie there was a short span of woods before entering Grand Prairie. Grand Prairie is much like Chesser. The group did see a pair of sandhill cranes, a doe, and lots of wading birds. A few duck flew overhead. The group took a break near the end of the prairie and just before turning down the trail to Monkey Lake. The flotilla reached the Monkey Lake shelter at about 1:30. 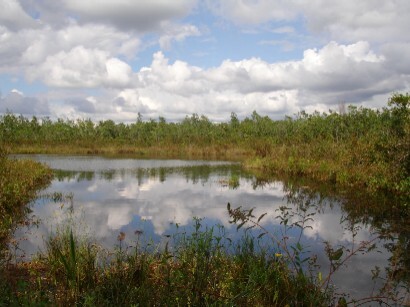 Monkey Lake is a small but picturesque lake rimmed by swamp grasses and trees. The shelter was in excellent shape except that the composting toilet was overdue a visit from the honey wagon. The large tree which was blown down by the fierce winds during the March trip still lay beside the shelter. After unloading the boats Roy demonstrated his new major award, a chair which is carried as a backpack and has numerous amenities such as cup holders and fishing rod holders. It lacked one essential feature which only Art’s throne chair has, but it was not missed since there was an outhouse available for those with stomach enough to endure it. Once the paddlers had rested and eaten a bit more a few traveled to Buzzard Roost Lake to try the fishing. Buzzard Roost Lake is seventeen acres and thus one of the larger lakes in the swamp interior. It is also a very pretty lake. 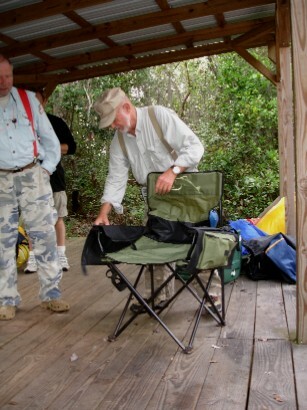 Ranger Jim Shelton had told Charlie that the lakes around the shelter were full of easily-caught catfish. That did not prove true. Richard did manage to catch a two-foot bowfin but Joey, Charlie, Rick, Julie, and Art did not catch anything. The wind was strong enough that a lot of effort was expended keeping the canoes out of the weeds and grass along the shore’s edge. When the would-be fishing trip ended Art began cooking his Elmo pot roast in the dutch oven. It was ready to be eaten by about 6:30 so it was consumed before dark. Janice picked a bouquet of wildflowers to decorate the table and she provided some special drink for the few who wished to try it. Dark comes fairly early in October so the lantern was lit and everyone sat around telling lies and enjoying the cool. Diane brought along a magic potion called Badger Bug Balm and it is so effective that it probably qualifies as a major award. Tim also had a Thermacell butane bug repeller and it works, too. Art fogged the area with aerosol repellent so the bugs were not too much annoyance. The tents were all pitched when the rain came. It came with a vengeance but everyone stayed dry under the shelter. None of the tents leaked including the former Ellis tent which Art rescued and repaired. It stopped raining before bedtime. Janice badmouthed Charlie about getting up too early and awakening everyone so the King vowed not to be the first one to arise. Everyone got a good night’s sleep and no one was up before seven. Charlie made coffee in the twenty-cup percolator and just about all of it was drunk. Rick and Richard made a traditional breakfast of sausage, eggs (yellow ones), grits, and tangerines. The cooked it on the Camp Partner major award stove. After breakfast there was the usual conversation. By popular demand the stories about the town drunk and Jason were not told. Eventually everyone packed the boats and got ready for the journey back to the take-out. Rick and Richard did a little fishing in Monkey Lake while everyone else was still packing, and Rick landed a nice chain pickerel. Since it was too late to cook it he released it back for the alligators to eat. The return trip followed the same route. It was again easy paddling. There were only a couple of places with low water through trembling earth, but none required poling or getting out of the canoes. 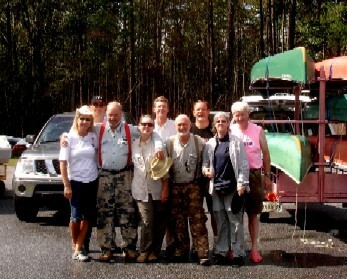 The group met up with Chip Campbell of Okefenokee Adventures who was giving a tour to a bunch of canoeists and kayakers. Chip did say that Craven’s Hammock would someday be available and he promised to see that the honey wagon would be sent to Monkey Lake. The usual birds were observed and there was another pair of sandhill cranes. Just before reaching the canal Rick and Richard found two very large alligators sunning in the grass about a hundred yards from the channels. The other alligators which the group encountered had all been swimming, submerged except for their heads. 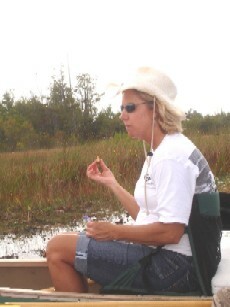 Julie was especially intrigued by the alligators but declined an invitation to paddle closer. She was quite a good rookies. Not only was the trip her first with the Fellow Travelers, it was her first experience i n a canoe or in a tent. Once back on the Suwannee Canal everyone started paddling furiously toward the take-out because it looked like the group would be blessed with a little more rain. The furious paddling was to no avail and a cloudburst came with a little more than a mile left to canoe. It rained hard but it did not rain long. By the time the gang arrived at the dock the sun was shining. After loading the canoes everyone said fond farewells and departed for home. It was a wonderful trip devoid of knife fights, burned or uncooked food, canoe flips, or any other unpleasantries.